Why Do I Need Generator Maintenance? Why perform this standby generator maintenance? While the average life expectancy of a well-maintained car is approximately 5000 hours (assuming 300,000 miles at 60 mph), a typical standby generator set can last from 10,000 to 30,000 hours. On the other hand, a standby generator might operate as little as 26 hours a year (based on only 30 minutes of weekly exercise and no outages) or as much as several hundred hours a year, depending upon the number and duration of power outages. In either case, a standby generator set could conceivably last 20 to 30 years. One way to ensure a long, reliable operating life is to implement a good maintenance program . Preventive maintenance and service are typically done on a schedule based upon engine hours and/or time periods. The maintenance cycle can—and should—be adapted to meet specific application needs. The more hours per year a unit operates, the more frequently it will require service. Environment also plays a role: The more severe the environment (dusty, extremely hot or cold, highly humid, etc. ), the more frequent the need for service may be. Maintain general cleanliness of the generator and its surroundings. Check the oil level when the unit is not running. If the generator has been running, wait for 10 minutes after it shuts down to check the oil level (this allows all of the oil in the engine to drain back into the sump). Maintain the oil level as close to the full mark as possible without overfilling. Make sure there is adequate coolant by checking the level in the overflow tank. For diesel units, check the fuel level and the fuel/water separators. Add fuel and drain water from the separators as necessary. For gaseous units, inspect the fuel-supply piping for leaks or obvious damage. Confirm that there are no loose clamps or wire connections, and no corrosion or damage to terminals or wiring. Inspect batteries for cleanliness and signs of corrosion. Check the operation of the battery charger. In addition to periodic inspections; check the coolant thermal-protection level every six months. Use the appropriate tester for the type of coolant being used. At the same time, inspect the accessory drive belts for correct tension and condition. 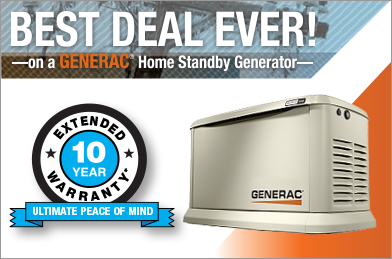 Annual maintenance of your standby generator begins with changing the engine oil and filter. If you want to extend oil-change intervals, consider an oil-analysis program . This will give you recommendations based on the actual condition of the lubricating oil. Replace the air filter and fuel filters, as well. If it is a diesel unit that does not use a lot of the fuel in its storage tank, consider having the fuel in the tank filtered, or long life additives added. Too often items that require annual inspections, such as the alternator and transfer switch, are overlooked. Alternators that are producing good power usually only require a visual inspection. Dirt, heat and moisture are their biggest enemies. Dirt can block the heat transfer necessary to keep the windings cool. Heat can damage the insulation on the windings. Moisture can cause windings to short to each other or to ground. Any of these situations will reduce the power that a winding can produce. Most alternator manufacturers provide recommendations for testing winding resistance and cleaning windings, if necessary. Transfer switches can be a little more challenging to inspect and maintain. To do a thorough annual inspection requires turning off all power to the switch. This may involve coordinating a planned outage for a specific time period on a weekend or during the night. Here’s a handy checklist to help guide you as you work to maintain your standby generator(s). Be sure to take note of the frequency recommendations for these maintenance activities. Run the generator (typically no-load, automatic transfer switch exercise cycle). Ensure that the generator is in “Auto” mode, for automatic start-up. Check for oil leaks and inspect lubrication system hoses and connectors.